Hows everyone's Christmas shopping going? Oh, you haven't started?! Well neither have I! I remember telling myself last year that I would start in November already. Well, that sure didn't happen! Today I've rounded up some of my favourites for you all to help make your shopping a little easier. 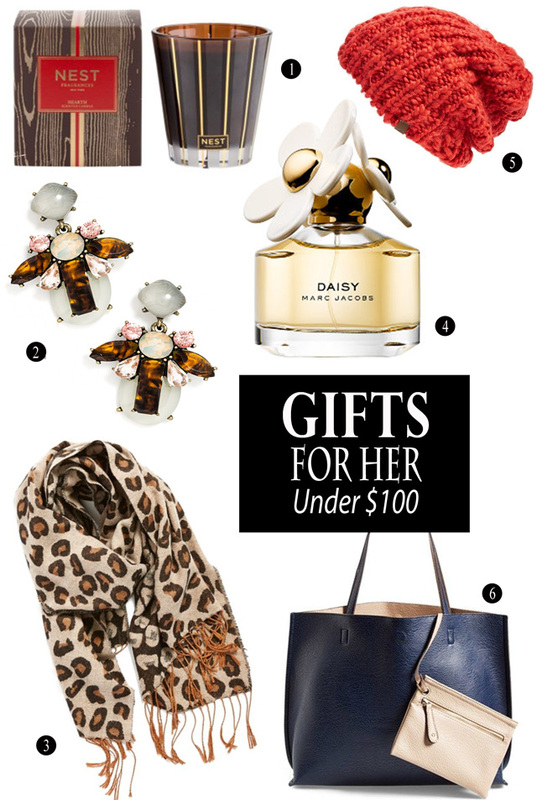 And every item on this list is under $100! These would be the perfect gifts for those special women in your life, whether it's your best friend, daughter, sister, sister-in-law, mom, etc. Thank you Kiki! I really need to get a beanie like this soon:-). These are all such beautiful picks! Haha, when you asked how is everyone's Christmas shopping going, I instantly answered in my head, I haven't started yet! Haha. I need to get on that soon. Thanks Amanda! I know It's pretty bad because I know the malls will check be packed right now... Hope ur having an awesome weekend:-). Lovely selection! I love Marc Jacobs perfumes. These are SUCH great gift ideas! I'm seriously struggling with gifts this year so I love these posts to get ideas. Those earrings from the Gal Meets Glam collection are my favorite! Thanks Kelly! I know what u mean.. I always have the hardest time finding gifts for people. And I know gc might not always be the most creative option, however u definitely can't go wrong with them either! Gal meets glam collection is stunning and when she came out with these I wanted to grab a pair, but they sold out so quickly!! The earrings are incredible! I'd buy those in a heartbeat. Thanks Aleczandra! They are definitely gorgeous:-). Hope ur having an awesome weekend! I love the hat, the bag, the perfume...can I have all of it? Such great picks! Hahaha I know, right!? Think I'll be doing some shopping for myself:p.
Ella, this is such a nice gift guide:) I would be really happy if I got any of your picks as a gift. I haven't started gift shopping either. I am such a last minute person when it comes to gifts:) But I guess it's better for my wallet, because there is much more stuff on sale closer to Christmas, haha. Thank you Yulia! Hahaha well I would love to be ur secret santa then:p. That is true actually, I usually go a few days before anyway and hopefully during the week because no way will I be at the mall on weekends, especially during this time of year! Those earrings and bag are amazing! Great gift guide! What a wonderful gift guide! Absolutely love your selection! The earrings look absolutely fantastic! Especially that pretty reversible leather tote & that cute beanie! Thank you Nadia! You can never go wrong with a reversible leather tote! I think I may have to get that beanie ... ! This is a super great guide! I love Marc Jacobs fragrances and you can never go wrong with candles. Thanks for sharing Ela. Thank you Joanna! Really glad u liked it and hope u found it helpful. And yes I agree, I'm always stocking up on candles. Hope ur having an awesome week!